Recent private information leaks from various social media websites have unsettled users as it was revealed that more than 65 million Tumblr passwords were leaked by hackers, over 427 million Myspace accounts were stolen by hackers, all while TeamViewer reinforces security measures in spite of its denials of being hacked. Just when everybody thought that this security breach news wave was over, another tech giant confirmed its clients are the victims of privacy breaches. 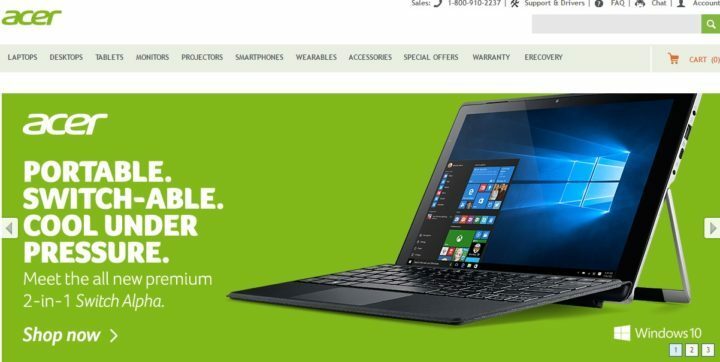 Today, Acer revealed that it had suffered from a widespread data breach, affecting clients who had used its United States online shopping portal from May 12, 2015 to April 28, 2016. Unfortunately, this data breach is much more severe than those security breaches that affected Tumblr and MySpace. Very sensitive customer information may have been accessed by a third-party, including confidential data such as addresses, CCV security codes, credit card numbers and dates of expiry, among other information. Acer submitted a letter to the California Attorney General’s office, listing the possible consequences of this security breach. Based on our records, we have determined that your information may have been affected, potentially including your name, address, card number ending in [insert], expiration date and three-digit security codes. We do not collect Social Security numbers, and we have not identified evidence indicating that password or login credentials were affected. The company took immediate steps to tackle this security issue and asked outside cybersecurity experts for help. Acer has also reported this issue to its credit card payment processor and to federal law enforcement. If you’ve recently accessed Acer‘s US shopping portal and suspect you are a victim of identity theft or fraud, you can file a police report. For more information on how to protect yourself against identity theft, you may contact your State Attorney General’s office or the U.S. Federal Trade Commission.